The increased popularity of handmade is touching all age and economic groups. Young and old… at home and abroad… People are turning to craft to create beautiful and meaningful items. For some, it’s a way to express themselves creatively, as well as connect with others. However, for some, crafting is used to make statements and promote change within their communities. This book will give you ideas, it will provide you with inspiration, and it will challenge you to try something new. Why not use your talent to think a little more “green”, beautify your community, join a group of like-minded folks, pay tribute to your past or make a statement about what matters to you? Knit Bombing (or crochet!) … See an amazing bench-warmer pattern by the Jafagirls! How to connect with the women of our past… After all, aprons and Granny Squares are back and here to stay! Get excited about helping a cause… and support the The Red Scarf Project. Protect the earth… and make vibrant art from plastic bags. Ravelry!… This is one great online hub of crafty-connectedness! This is a book that I will be turning to again and again. 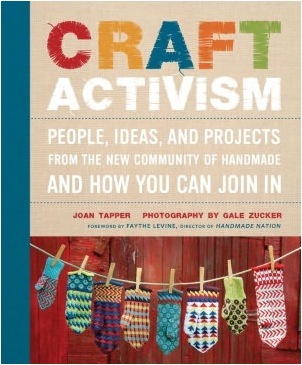 It perfectly honors the grassroots movement that has become a crafting revolution. It provides a generous amount of practical ideas along with a dose of sentimental tribute to those who have paved the “crafty- highway” for us. So glad you enjoyed the book, and thanks for passing on comments to the community of crafters. We certainly live increasingly in DIY times, and, yes, craft can make a difference. If you make any projects from the book, please send a picture to the book blog. And thanks again! Joan, Thanks for visiting– I hope you will stop by again. It was fun to read and review your fantastic book! I added the link to your website to my article. Happy reading and happy crafting! Sounds like an amazing book! I love it when creativity connects with community. I will be checking this out at the bookstore soon.. Great review!